Welcome to 2012! As you map out your conference calendar for this New Year, in addition to ISCB's signature conferences (see www.iscb.org/iscb-conferences), be sure to consider participating in these affiliated conferences of our Society. 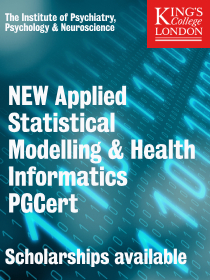 Each one offers a unique mix of scientific content with themes essential to computational biologists and bioinformaticists. Scroll down for details on upcoming key dates and opportunities for the following events. * Subscribe to the conference newsletter via the URL above for alerts on open calls, deadlines, and program updates. Call for Highlights: We invite the submission of talks describing research published as full journal papers between August 31, 2011 and September 30, 2012 of topics including, but not limited to: computational tools for NGS, cancer genome informatics, cloud and work flows for reproducible bioinformatics, protein bioinformatics, metagenomics, RNA informatics, machine learning, and open problems in computational biology. Publications that are "in press" and already linked on the journal web site by September 30, 2012 are welcome. A group of experts will select the papers to be presented at the meeting considering the impact of the work on the field, the likelihood that the work will make a good presentation, and the relevance to biomedicine and computational biology. Accepted presenters to the Highlights Track are required to make the presentation themselves (rather than assign a co-author to make the presentation), and must register and pay to attend the conference. Papers published from Aug 31, 2011 to Sep 30, 2012 considered. Call for Posters: Poster abstracts in the same topic areas are also invited. Please submit your poster directly to the ISCB submission site at www.iscb.org/submissions/index.php?id=129 by the submission deadline of October 31, 2012. Accepted poster presenters must register and pay to attend the conference. 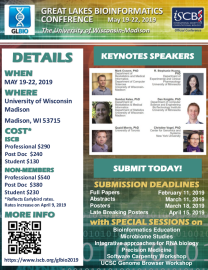 We invite you to participate in the The Great Lakes Bioinformatics Conference , taking place in Ann Arbor, Michigan this coming May. ALL CALLS FOR PRESENTATIONS CLOSE IN JUST 10 DAYS! GLBIO topic areas include Algorithm Development and Machine Learning, Bioimaging, Databases and Ontologies, Disease Models and Epidemiology, Evolution and Comparative Genomics, Gene Regulation and Transcriptomics, Metagenomics, Mass Spectrometry and Proteomics, Population Genomics, Protein Interactions and Molecular Networks, Protein Structure and Function, Sequence Analysis, and Text Mining. This year's keynote presentations will cover a broad range of interesting topics. Keynote Speakers for 2012 are: Howard Cash of Gene Codes, Michael Lynch of Indiana University, Mercedes Pascual of the University of Michigan, and Russell Schwartz of Carnegie Mellon University. We look forward to receiving your submission before the deadline, and to welcoming you to Ann Arbor in May! January 31, 2012 - The International Society For Computational Biology (ISCB) has awarded the Overton Prize for outstanding accomplishment to Ziv Bar-Joseph, associate professor at the School of Computer Science at Carnegie Mellon University in Pittsburgh. The Overton Prize is awarded annually to an early to mid-career scientist who has made a significant contribution to the field of computational biology. In recognition of the award, Bar-Joseph will give a keynote address at the Annual International Conference on Intelligent Systems for Molecular Biology in July, to be held this year in Long Beach, California (ISMB; www.iscb.org/ismb2012). Bar-Joseph gained a PhD in computer science from the Massachusetts Institute of Technology in 2003 where he also discovered the challenge of analysing high-throughput biological data using computational techniques. Since then, he has developed important techniques using machine learning for integrating multiple biological data sources in ways that infer dynamic regulatory networks. He has also pioneered the search for biological solutions to complex computational problems, such as how to build robust distributed networks efficiently. "We have all been impressed by the quality of his scientific contribution and the novelty of the approaches he has developed,” says Alfonso Valencia, chair of the ISCB awards committee. For more information about the Overton Prize and its past recipients, please visit www.iscb.org/iscb-awards/overton-prize. The deadline for submissions for the 5th annual joint RECOMB Conference on Regulatory and Systems Genomics, with DREAM Challenges, is just two weeks away. We invite you to participate by submitting a paper or abstract. For more information, visit: http://recomb-2012.c2b2.columbia.edu/. The 5th annual joint RECOMB Conference on Regulatory and Systems Genomics, with DREAM Challenges is one of the premier annual meetings for computational and experimental scientists in the fields of regulatory genomics and systems biology, and is now an official conference of the International Society for Computational Biology. The meeting will be held at the Hotel Sofitel San Francisco Bay on November 12-15, 2012. All submissions of full-length papers will be considered for publication in Genome Research and the Journal of Computational Biology. Accepted papers will be published in conjunction with the conference and authors of selected papers will present their work at the meeting. Our program committee will review all submitted papers in collaboration with the journal editors and the conference chairs. 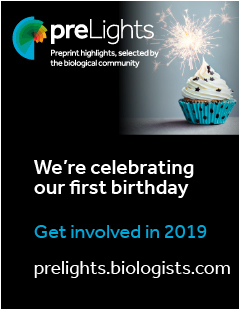 We are also accepting submissions of abstracts, including both original unpublished work and work that has been published or accepted for publication by a high-impact journal between January 1 and November 1, 2012. Unpublished work will be considered for either an oral or a poster presentation. Work already accepted for publication will be considered for an oral presentation only. We are also still accepting submissions for participation in the DREAM Challenges, designed to identify the best practices for predicting the structure of biological networks. Lastly, we are also still inviting nominations for RegGen-TopTen 2011, our list of the most influential papers of 2011 in the fields of Regulatory and Systems Genomics, in conjunction with the ISMB Special Interest Group on Regulatory Genomics (RegGen SIG). See our website above for more information. We are looking forward to very exciting program. Our invited speakers include Howard Chang, Job Dekker, Angela DePace, Joe Ecker, Yoav Gilad, Len Pennacchio, Saurabh Sinha, Stephen Friend, Jonathan Weissman, Dean Felsher, Michael Elowitz, Joe Nadeau, Markus Covert, Joe Gray, and Ernest Fraenkel. We hope that you will participate and look forward to seeing you in San Francisco this November! Registration is also now open and early registration rates will expire October 12th. We hope that you will participate and look forward to seeing you in San Francisco this November! Sept 04: The Roots of Bioinformatics in ISMB published in August issue of PLoS Computational Biology – Read all about it! Nominations for the 2012 ISCB Class of Fellows is now open. If you know of a member that you believe has earned his or her place among ISCB's Fellows through exceptional and exemplary contributions to the field of computational biology/bioinformatics, please nominate today. 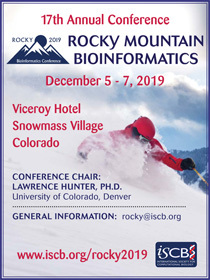 Since 2009 the leadership of the International Society for Computational Biology has been honoring our most distinctive members as Fellows, and this is your chance to name our 2012 Class of Fellows. 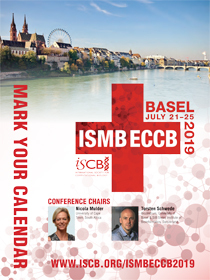 The nomination form is available at www.iscb.org/fellow-nomination (as only members can nominate, login is required; if you are not a current member please join today! ).